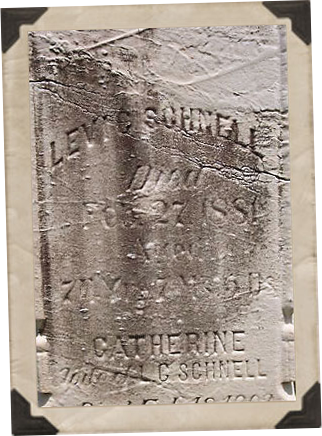 Regardless, his headstone states that Levi was born on 22 July 1806 in what is now Germany.4 The exact location of his birth remains a mystery, as do his parents. Levi's immigration manifest says that he was from the country of Hannover.5, A However, Hannover was a large region and we never get any more identifying information than that. Over the next 7 years they would have 4 children together, starting with son Lewis in 1838, followed by Mary in 1840, Elizabeth in 1842, and ending with son William in 1844. It's not known where they initially lived after their marriage but it's most likely a place they rented. They may have started out in or around the city of Cleveland, but we do know the Schnell family eventually moved out to Medina County. 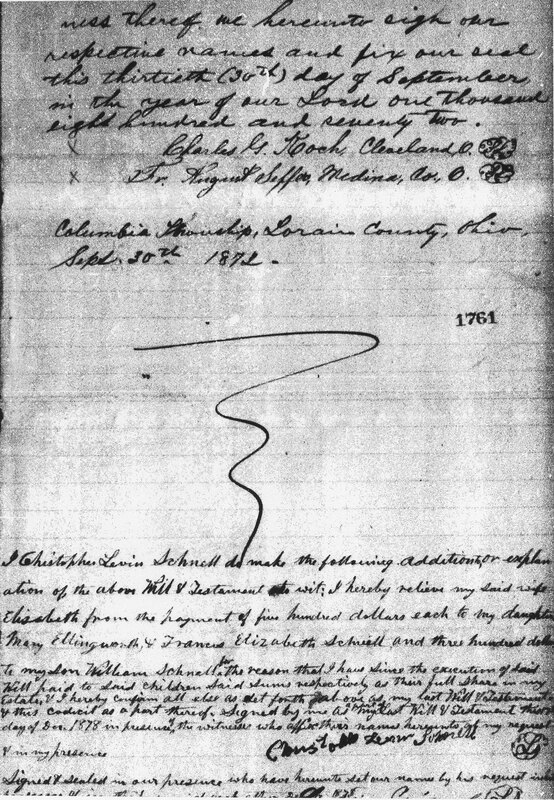 On the 2nd Sept 1843, Levi purchased 30 acres of land in Liverpool Township, Medina County from Gottlieb & Maria Mack of Cleveland for $300.00. The land was officially known as the southern-middle part of lot 1, section 19. At some point, whether a clerical error on purchase acreage or through other acquisitions, Levi would own 43 acres in total. 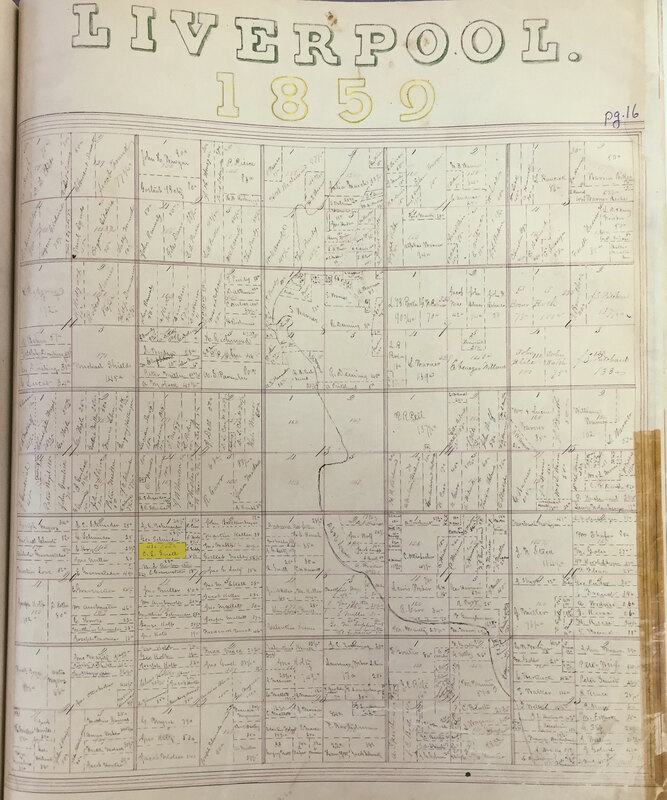 The Agricultural Census that year also provided a snapshot of his property and depicted not only a man in the trade of cabinetry, but a skilled farmer as well. Levi owned 44 acres, 30 of which had been cleared for use. His farm was valued at $900 and his machinery at $80. 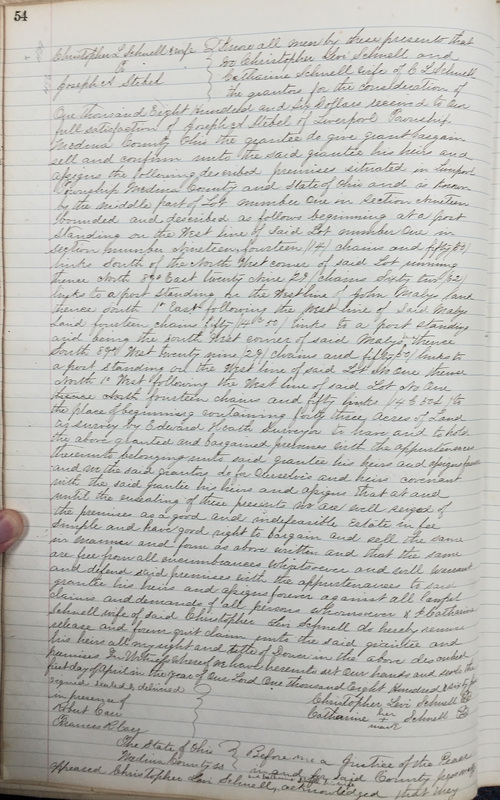 His farm cared for 2 horses, 3 milk cows, 5 other cattle, 7 sheep and 2 pigs valued at $240. In the previous season's harvest the farm had produced 75 bushels of wheat, 50 bushels of Indian corn, 14 bushels of oats, 38 lbs. of wool, 15 bushels of Irish potatoes, 50 lobs. of butter, and 8 tons of hay. The animals sent to slaughter totaled $10. The exact date is unknown but, sometime between the 1850 census and 1852, Levi's wife Mary passed away from causes also unknown. Neither a record nor a headstone have been found to document her death. Catherine gave birth to their first child, Samuel Solon Schnell on 22 Apr 1854 in what Samuel's obituary states is Valley City, a small town in Liverpool Township.10 Following Samuel are his four siblings, sisters Priscilla in 1856 and Phebe in 1859, and brothers Leonard in 1860 and Charles in 1866. 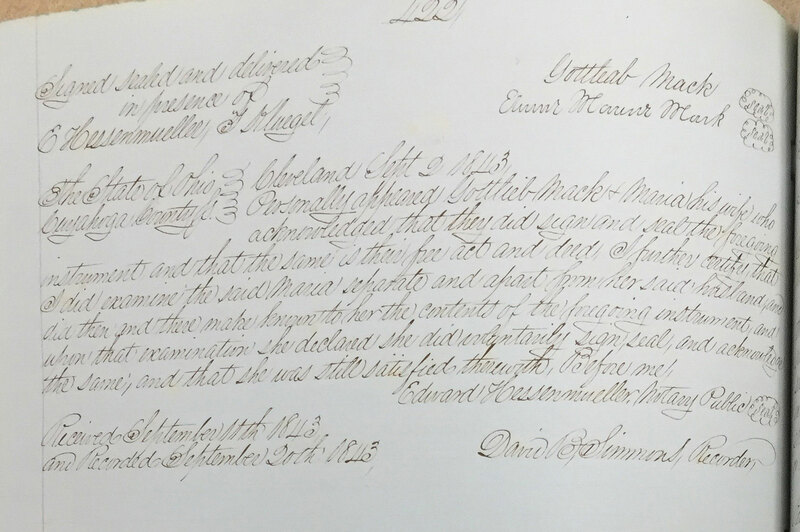 Levi's Will from 1872 allows us to finally locate his daughters from his first marriage. 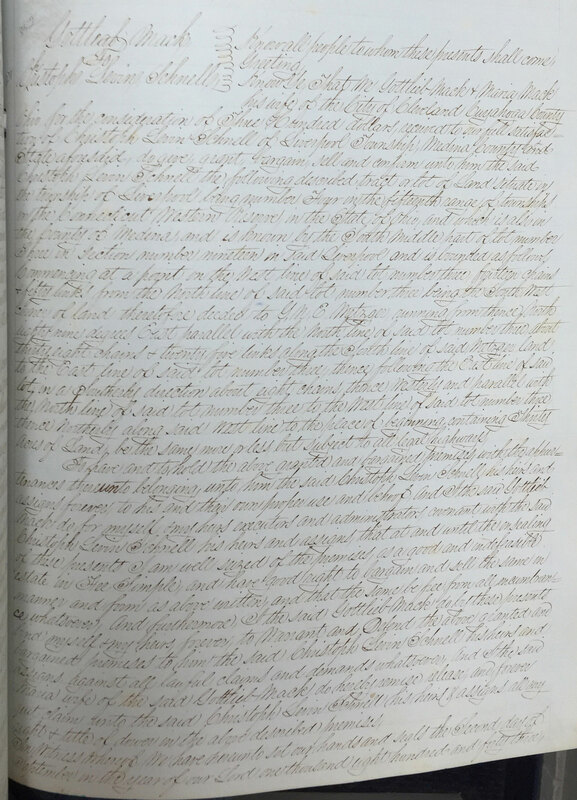 The will states that his daughter Mary's name was now Mary Ellingsworth and was widowed, while daughter Frances Elizabeth was not married. We can track both "Frances E" & "Mary Ellingsworth" to the Denver area in 1880. Mary remarries a Frank Green in Glenwood Springs in 1886 and settles down there. Francis Elizabeth Snell, 1842 – ? 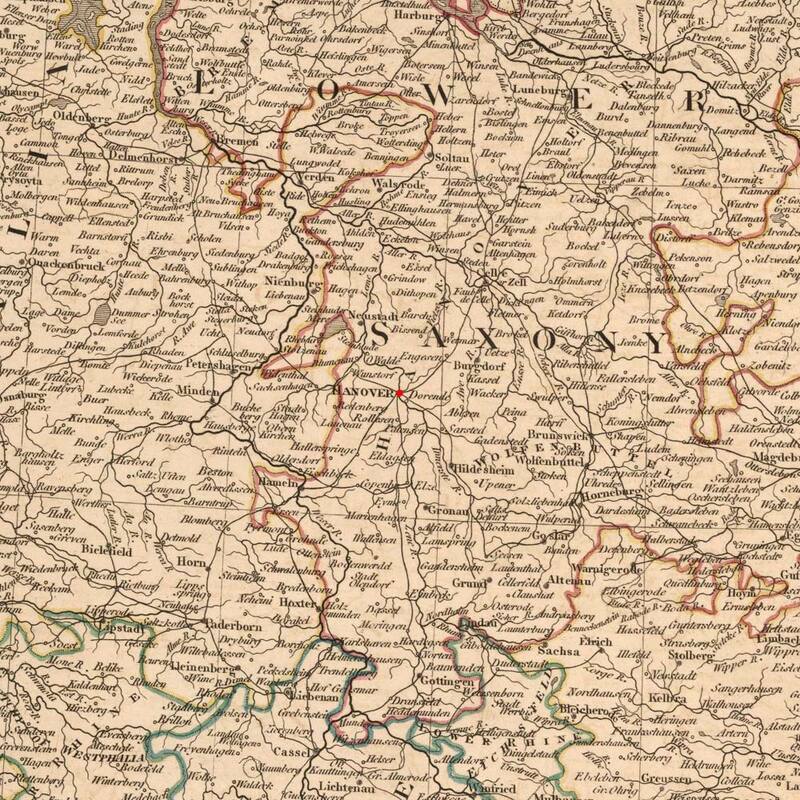 A Hannover was an independent kingdom until it was annexed to Prussia and became the Prussian capital in 1866 during the Austro-Prussian War. Prussia was disbanded after World War I, eventually becoming a part of Germany. B A Joiner is a type of carpenter, commonly associated with cabinetry. C Bremen at the time was its own sovereign republic, surrounded by Prussia, and didn't become a part of the German Empire until 1871. 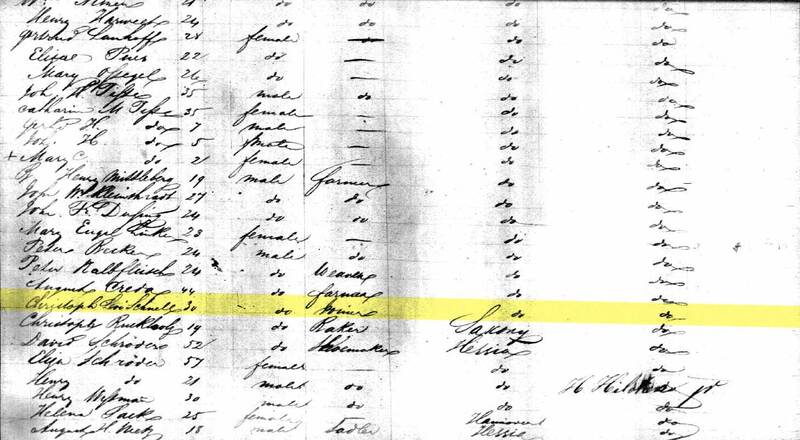 D Catherine is not mentioned by name on the 1840 census. Here, like everyone else, she is only noted as a tally mark, a number filed under the head of the household. Names of everyone in the household wouldn't be cataloged until 1850. 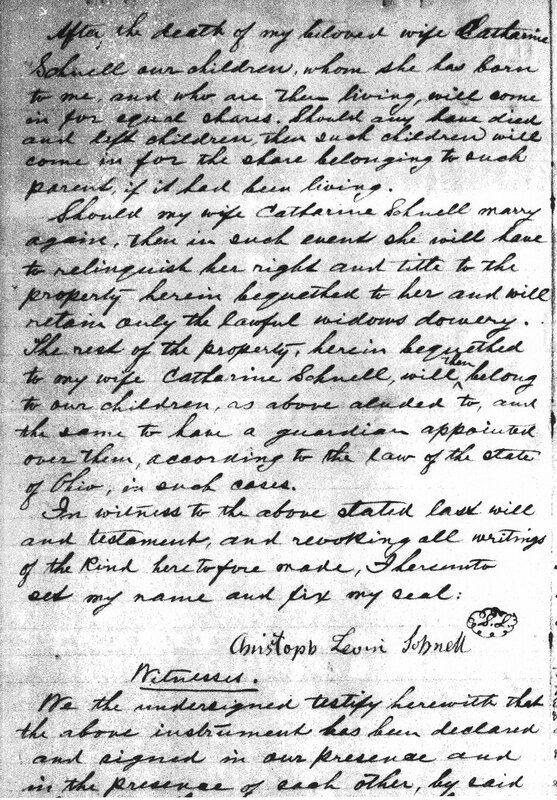 E In administering Levi's estate at the Lorain County Common Pleas Court Case #18072 in June of 1921, all reference to Levi spells out his full name as Christopher Levin Schnell. F The Schnell family lived in Beebetown which is officially a part of Medina County. However, the tiny village sits along the border of Lorain, Medina and Cuyahoga Counties at the corner of Boston and Marks Road. This same intersection is the location of Levi Schnell's property. 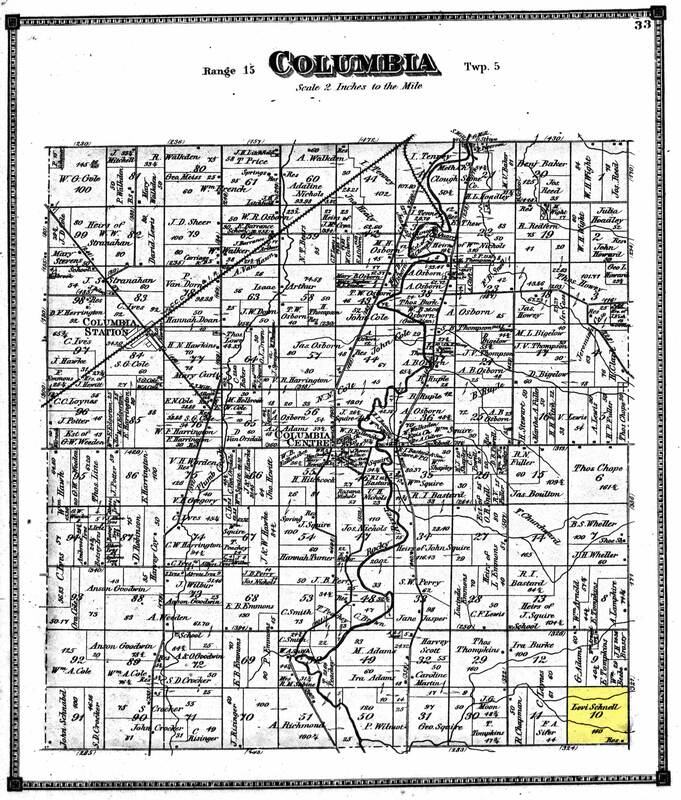 His land is officially mapped and under jurisdiction of Columbia Township, Lorain County, Ohio. It is the very corner of Lorain County. Crossing the street to the east would put you in Cuyahoga County and to the south would put you in Medina County. This explains the massive contradiction between records on residence. H Information about the sale of the Schnell family land was relayed to me by my Grandmother, a daughter of Levi's Grandson. She was born & raised on Levi's land in Beebetown. I William's story seems eerily familiar to other instances of family soldiers and their brothers in arms. I'd assume WIlliam came back to his family and tried to resume life as normal after the war, but suffered from PTSD. Trying to return to the normal post-war life was too difficult. He likely went out west to escape and be alone; putting some distance between him and other people. J The reason I believe Levi and Mary may have lived in Cleveland is circumstantial. The only evidence I have that points to this possibility is a marriage between the couple in Cuyahoga County, not Medina, and they purchased their land in Medina from a couple that lived in Cleveland, which is in Cuyahoga County, per the deed of purchase. K I wouldn't read too deeply into this. Being the husband of a cousin to the writer's ancestor (no direct relation) Levi was only mentioned as a footnote in the book that included no research on this line. Where was Levi born in Hannover? Where did he first live in Ohio? What happened to his wife Mary and their daughters Mary & Elizabeth? 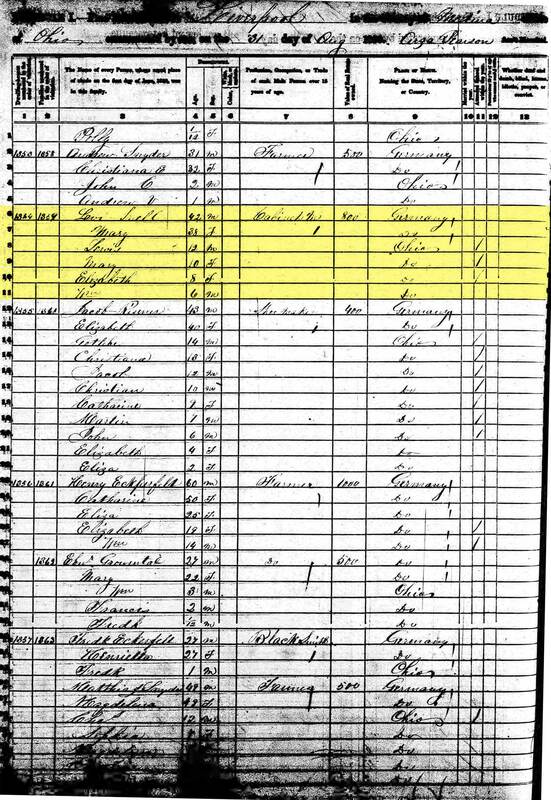 Where is the family in 1840? By this point they should have settled somewhere with 2 year old son Lewis/Louis. 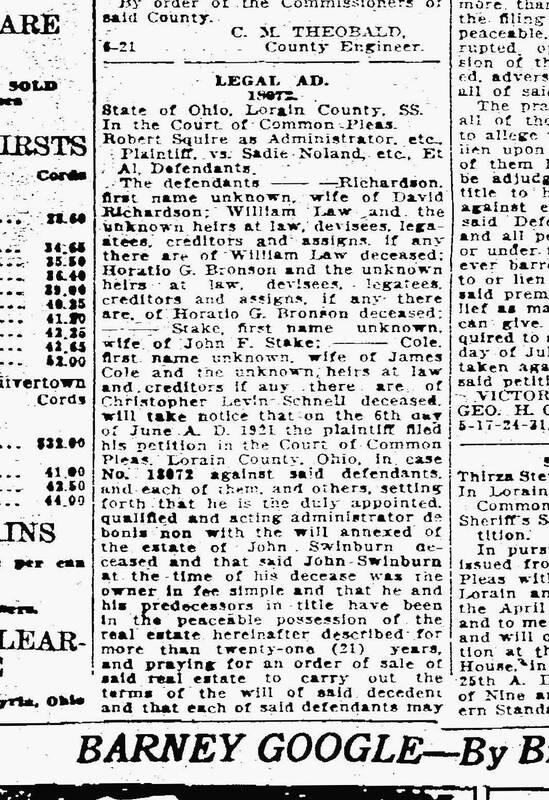 1 Legal Notice - Chronicle Telegram, The (Elyria, Ohio), 21 Jun 1921, pg. 9. 2 Ohio, County Marriages, 1789-2013," Database with images, FamilySearch (https://familysearch.org/ark:/61903/1:1:X8KY-PJP : accessed 30 June 2015), Levi Or Levin Snell Or Losnell and Maria Or Mary Richardson, 23 May 1837; citing Cuyahoga, Ohio, United States, reference ; county courthouses, Ohio; FHL microfilm 872,466. 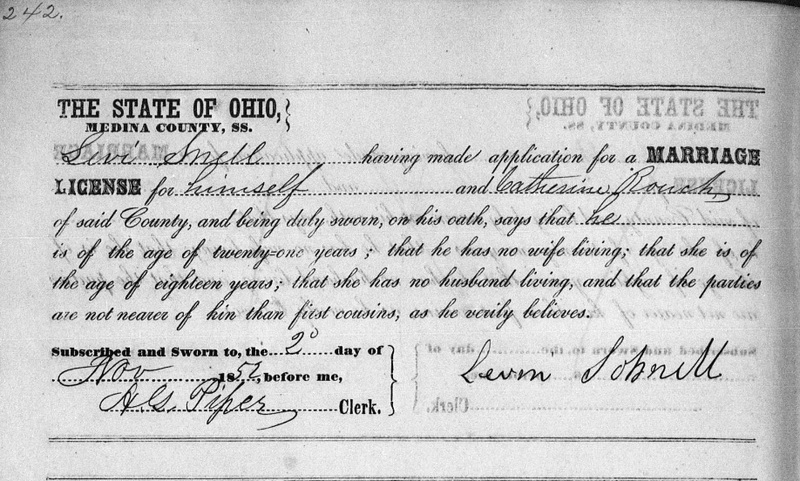 6 "Ohio, County Marriages, 1789-2013," database with images, FamilySearch (https://familysearch.org/ark:/61903/1:1:X8KY-PJP : accessed 2 July 2015), Levi Or Levin Snell Or Losnell and Maria Or Mary Richardson, 23 May 1837; citing Cuyahoga, Ohio, United States, reference ; county courthouses, Ohio; FHL microfilm 872,466. 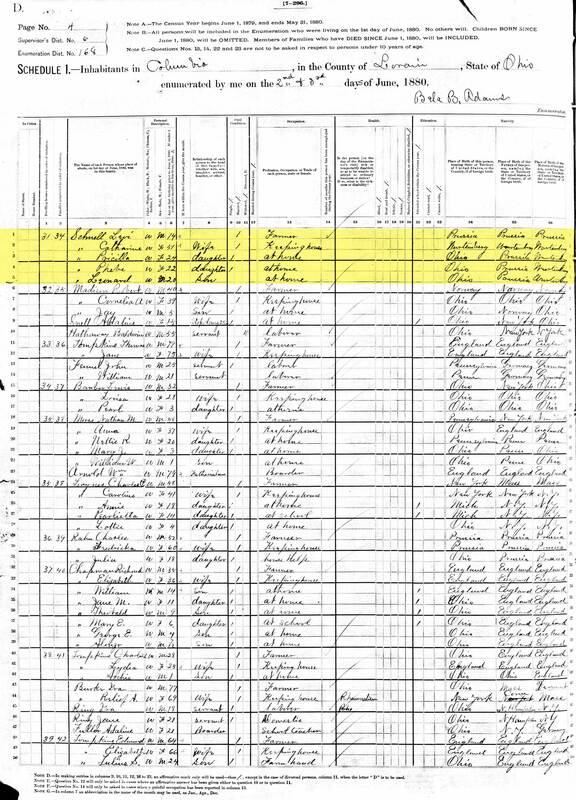 7 United States Census, 1850," Database with images, FamilySearch (https://familysearch.org/ark:/61903/1:1:MXQG-DZK : accessed 30 June 2015), Levi S?Ell, Liverpool, Medina, Ohio, United States; citing family 1359, NARA microfilm publication M432 (Washington, D.C.: National Archives and Records Administration, n.d.). 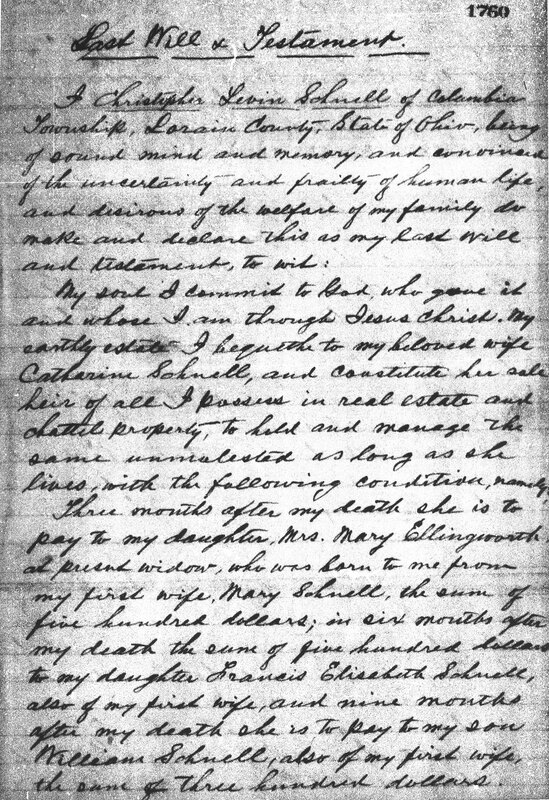 8 "Ohio, County Marriages, 1789-2013," database with images, FamilySearch (https://familysearch.org/ark:/61903/1:1:XZZP-S43 : accessed 1 July 2015), Levi Snell and Catherine Rouch, 02 Nov 1852; citing Medina, Ohio, United States, reference v B-1, p 242; county courthouses, Ohio; FHL microfilm 423,818. 9 "Ohio, County Marriages, 1789-2013," Database with images, FamilySearch (https://familysearch.org/ark:/61903/1:1:XZZL-VJM : accessed 1 July 2015), Levi Schnell and Cathrine Ranch, 07 Nov 1852; citing Medina, Ohio, United States, reference v B, p 371; county courthouses, Ohio; FHL microfilm 423,818. 10 "Ohio, Deaths, 1908-1953," Database with images, FamilySearch (https://familysearch.org/ark:/61903/1:1:XZC3-MRZ : accessed 1 July 2015), Samuel S Schnell, 02 May 1936; citing Cleveland, Cuyahoga Co., Ohio, reference fn 30102; FHL microfilm 2,022,659. 12 Linn County, Iowa Property Deed, 24 Mar 1856 for Tobias Rauch. 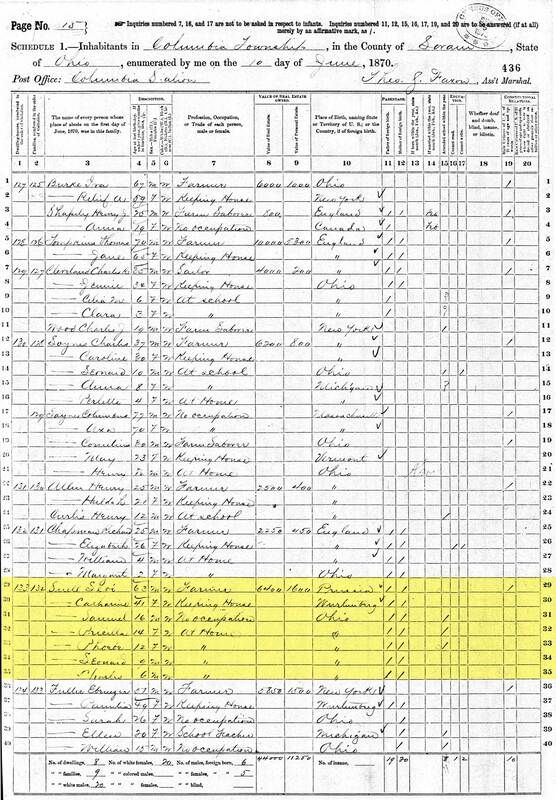 13 1860 U.S. Census for Lewis Snell in the home of Andrew Steinagle; Year: 1860; Census Place: Rapids, Linn, Iowa; Roll: ; Page: 426; Image: 426; 1860 U.S. census, population schedule. NARA microfilm publication M653, 1,438 rolls. Washington, D.C.: National Archives and Records. 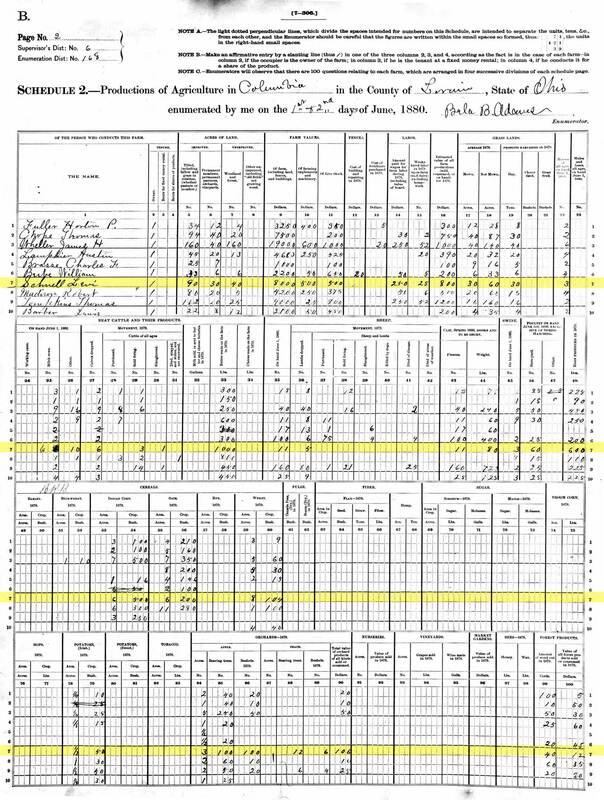 14 "United States Census, 1860," database, FamilySearch (https://familysearch.org/ark:/61903/1:1:MCG3-S6T : accessed 1 July 2015), Levi Snell, Liverpool Township, Medina, Ohio, United States; from "1860 U.S. Federal Census - Population," database, Fold3.com (http://www.fold3.com : n.d.); citing p. 47, household ID 396, NARA microfilm publication M653 (Washington, D.C.: National Archives and Records Administration, n.d.); FHL microfilm 805,007. 17 Record of Lewis Snell's capture at Battle of Shiloh; Thrift, WH 1908b: pg.525; Roster and Record of Iowa Soldiers in the War of the Rebellion 1861-66, Vol.2; 9th-16th Regiments. 18 Iowa Infantry. (1911). Revised roster, Company D, 12th Regiment, Iowa Infantry Volunteers [with supplement]. Place of publication not identified: Soper. Available via Archive.org (https://archive.org/stream/revisedrostercom00iowa#page/n11/mode/2up). 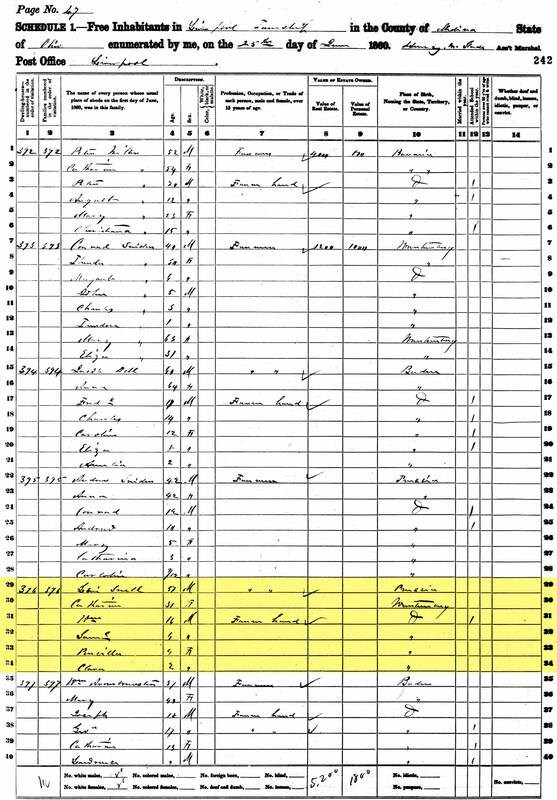 19 "United States Census, 1870," Database with images, FamilySearch (https://familysearch.org/ark:/61903/1:1:M6K5-QFJ : accessed 1 July 2015), William Snell in household of Andrew Lark, Ohio, United States; citing p. 4, family 29, NARA microfilm publication M593 (Washington D.C.: National Archives and Records Administration, n.d.); FHL microfilm 552,692. 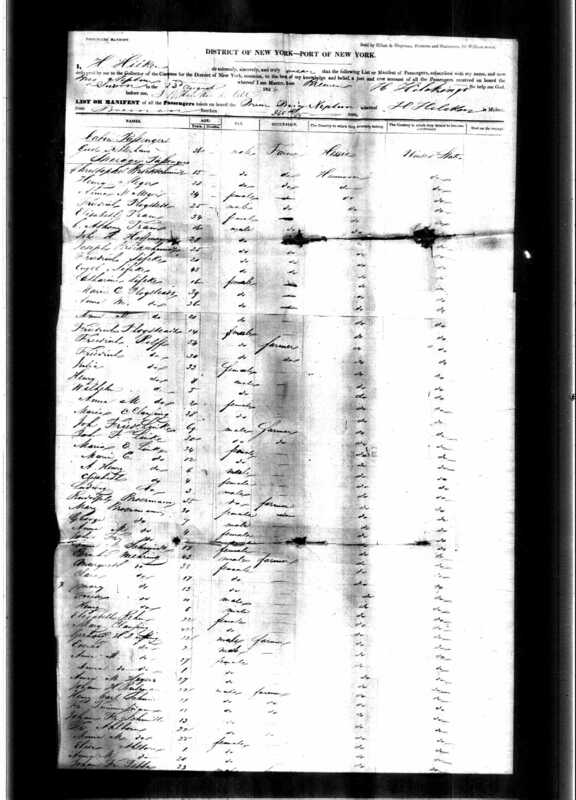 20 "United States Census, 1870," Database with images, FamilySearch (https://familysearch.org/ark:/61903/1:1:M6LM-NG3 : accessed 1 July 2015), Seri Suell, Ohio, United States; citing p. 15, family 132, NARA microfilm publication M593 (Washington D.C.: National Archives and Records Administration, n.d.); FHL microfilm 552,734. 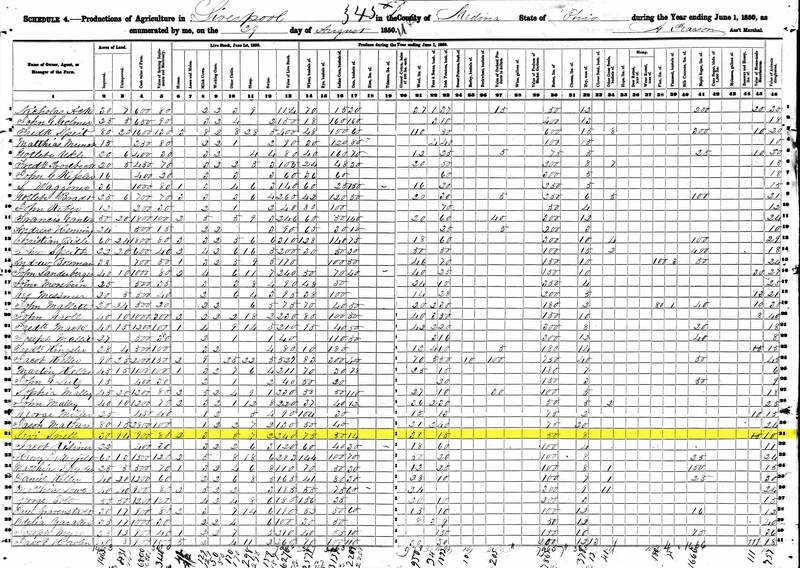 22 "United States Census, 1880," Database with images, FamilySearch (https://familysearch.org/ark:/61903/1:1:M89K-64X : accessed 1 July 2015), Levi Schnell, Columbia, Lorain, Ohio, United States; citing enumeration district 168, sheet 409D, NARA microfilm publication T9 (Washington D.C.: National Archives and Records Administration, n.d.), roll 1042; FHL microfilm 1,255,042. 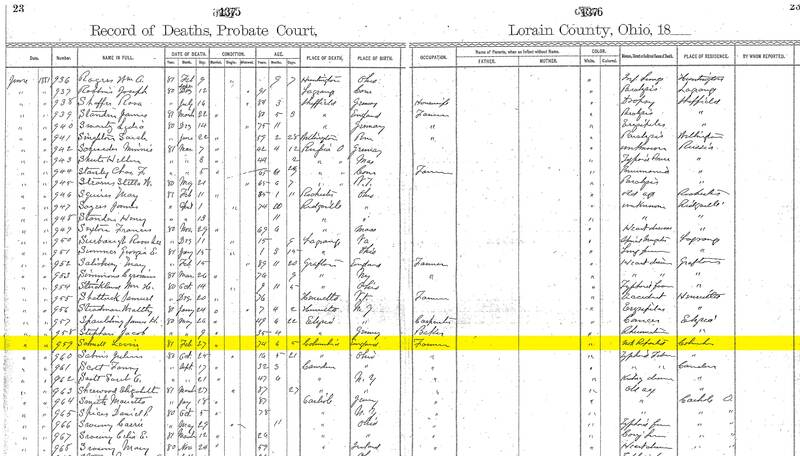 23 "Ohio, Deaths and Burials, 1854-1997," Database, FamilySearch (https://familysearch.org/ark:/61903/1:1:F6ZJ-1Y3 : accessed 1 July 2015), Levin Schnell, 27 Feb 1881; citing Columbia, Ohio, reference v 2 p 1375 fn 959; FHL microfilm 1,294,335.